Mazda has shared a brief video teasing what's believed to be the fourth-generation of the Mazda3 over a month before it's expected to make its official debut. Since June, it's been reported that the 2019 version of the Mazda3 compact sedan and hatchback -- models that have been in the company's portfolio since 2003 -- are expected to debut at the LA Motor Show at the end of next month. Mazda, however, gave us some candy apple red eye candy ahead of time. At the start of the video, we get a quick view of what looks to be the tail of a vibrant red hatchback, followed by a shadowed side view of a gray vehicle. The final two shots of the video say, "A New Era Begins," and "November 2018" against a black background. That's it. 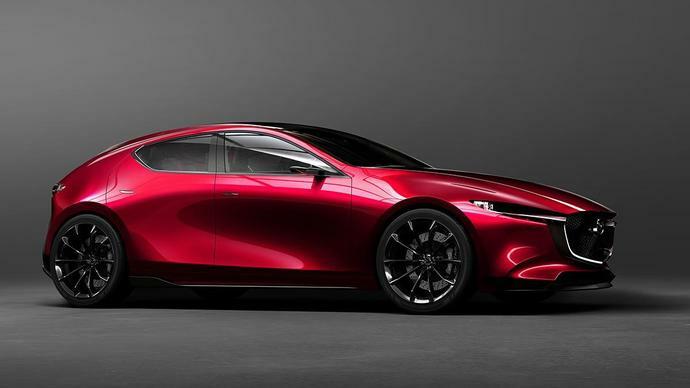 Across the board, however, it's expected to resemble the Mazda Kai Concept that was shown at the Tokyo Motor Show a year ago, and from the brief taste we got of the in the video, the 3 appears faithful to the concept. If we continue to draw inspiration from the Kai, the Mazda3 will probably have the same SKYACTIV-X gas engine which came out last August which the company describes as a "revolutionary powerplant that combines the free-revving characteristics of a gasoline engine with the fuel efficiency, torque, and fast initial response of a diesel unit." For the time being, we're waiting for the official release in LA or, perhaps, before that, more teasers.